Ceiling fans can add comfort and style to your home, however, finding the right ceiling fan for your kitchen, bedroom, or bathroom can be a challenge. Unlike air conditioning units, ceiling fans won’t lower a room’s temperature or remove humidity from the air, but they can save you money on your energy bills. At M&M Lighting in Houston, we’re proud to offer a large selection of ceiling fans in a variety of styles and finishes and we are always happy to answer any questions you may have. If you’re looking to upgrade your home’s current ceiling fans with more efficient models, browse our unique collection of fans online today! There are many things to take into consideration when it comes to shopping for ceiling fans. Since a ceiling fan’s primary purpose is to circulate air in a room, they can be useful in a variety of rooms throughout your home. If you’re looking for ways to move air around in your kitchen, installing a ceiling fan could be a great solution for you. 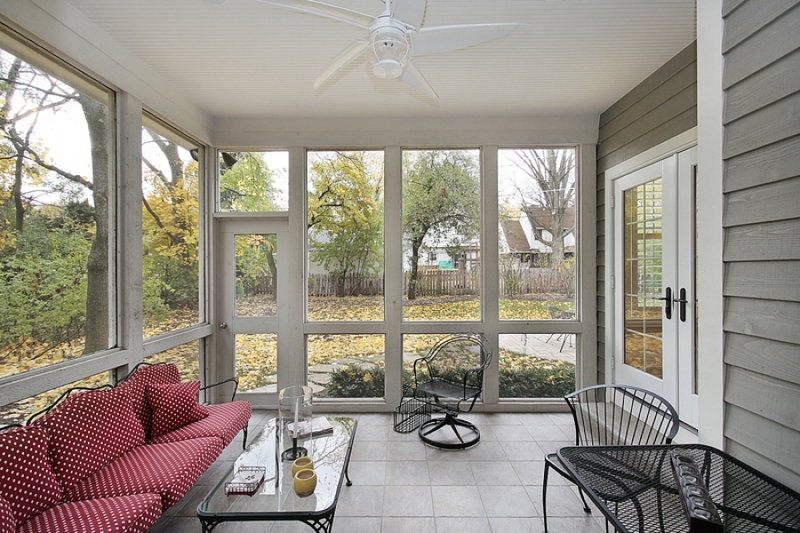 If you’re home features an open or screened porch, adding a ceiling fan can turn your space into a refreshing retreat. 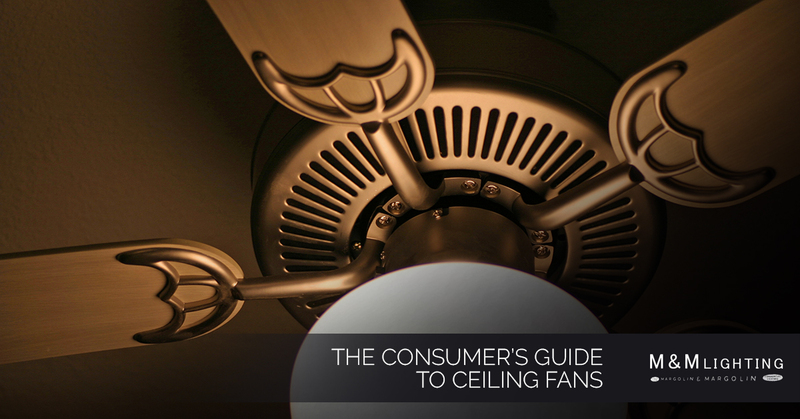 Let’s look at a few things to keep in mind when shopping for a new ceiling fan. Flush Mounts – Specifically made for rooms with low ceilings, flush mount ceiling fans are anchored directly to the ceiling. Downrod Mounts – This type of ceiling fan is specifically designed for rooms that feature high ceilings. Most of these fans include a three- to five-inch rod known as a downrod, which extends from the ceiling bracket to the top of the fan. When it comes to choosing a new ceiling fan for your home, there are a variety of ceiling fan blades available that can easily spruce up the interior decor of your residence. While the aesthetic appeal of a ceiling fan’s blades tends to be more of a design feature than a matter of utility or efficiency, there are many styles and colors to choose from. Some fans can host up to nine blades, while more traditional ceiling fans boast a four- to five-blade design. Ceiling fans are manufactured in an nearly endless array of designs and styles. At M&M Lighting in Houston, we’re proud to offer a large selection of ceiling fan styles, from modern to traditional and contemporary, and our lighting experts are more than happy to help you find the best ceiling fan for your home. If you have any questions about ceiling fan styles and designs, contact our lighting experts today! Now, let’s discuss some of the most popular ceiling fan designs and styles in Houston. Traditional Ceiling Fans – As their name suggests, traditional ceiling fans tend to be a bit more formal and ornate in their design. Most of these fans feature intricate details and a thoughtful design that has been inspired by classic and traditional architectural styles. These fans can add a touch of sophistication and warmth to any room in your home. Transitional Ceiling Fans – This type of ceiling fan offers a unique balance between traditional and contemporary design elements. Transitional ceiling fans can complement a wide range of interior decor options in a sophisticated and stylistic manner. If you’re looking for a fan that’s a blend of various designs and styles, a transitional ceiling fan may be for you! Modern Ceiling Fans – If you live in a modern home or apartment building, you may want to consider installing modern ceiling fans throughout your property. These fans offer clean lines and significantly less ornamentation than most fan designs. With a minimalist approach to design, modern fans can help bring out the more ornate pieces of decor in each room. Outdoor Ceiling Fans – Looking for a way to bring quality decor and style to an outdoor space of your home? Consider picking up an outdoor ceiling fan! These fans offer an especially durable design and they can help extend the usable living space of your home beyond its walls. M&M Lighting in Houston is proud to be a leading provider of stylish and affordable ceiling fans, lamps, LED lighting, chandeliers, and more. Browse our huge selection of ceiling fans online today or contact us with any questions you may have!